Welcome to Golf Simplified School with Donald Crawley – Class A PGA member, British PGA member, voted in the TOP 10 Best Teachers in the state of Arizona by Golf Digest and TOP 100 Teacher in America by GOLF Magazine (since 1999). You can visit Donald at the Boulders, Carefree, AZ January 1- May 11 and North Shore C.C, Glenview, IL 5/25- 7/3, Or have Donald bring the School to you! Each year GolfSimplified visits several private country clubs, and public golf courses to conduct private lessons and school packages from a half day to three day instruction schools. Contact Donald to bring a school to you in 2018. North Shore C.C, Chicago: May 25- July 3. Non members are welcome to take instruction. 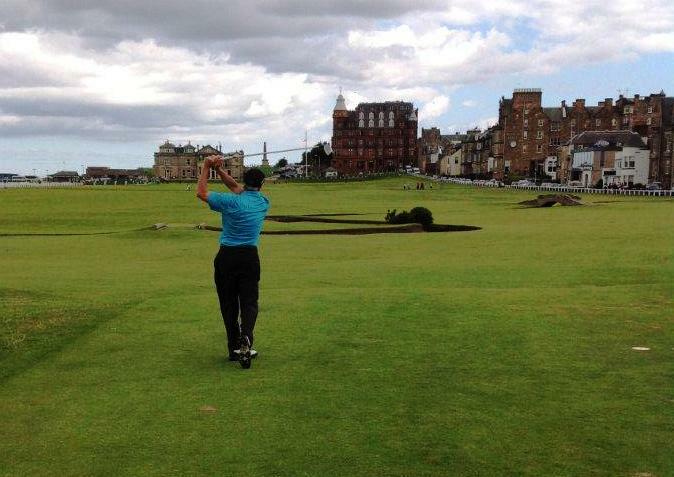 “This has been my first visit to the home of golf Scotland, and the best golf trip of my life. Having the details, air, transportation, hotel and golf, all taken care of in first class style, allowed me to focus on my golf and the beauty of the three courses we played: Royal Dornoch (the best in the world? ), Brora and Nairn.I will take another trip with Donald and GolfSimplified next year”. Dr Frank Agnone, AZ. ” Donald has been a huge help to the members over the years on his annual visit to Crystal Downs. We only hope he continues to bring his enthusiasm and skills to the club for many years.” Fred Muller, Director of Golf, Crystal Downs Golf Club, Michigan (#13 TOP 100 golf courses in America). “Thanks for bringing your GolfSimplified School, eleven years in a row, to help the members improve and enjoy their golf.” Mike Ingram, Director of Golf ,Brays Island Golf Club, Sheldon, South Carolina. ” I asked you to come teach me and my two brothers for a day. The word got out and you ended up teaching 20 students in our community and planning on another event next year. Thank you!” Eric Sonsalla, Lemmon, South Dakota. My school teaches simple techniques that will improve your game. I will work with you on your home course on the tee and on the course , continuing to provide you with constructive tips to better your game. GolfSimplified offers custom lesson packages for groups and individuals ideal for a business group, families and children. Please contact me if you have any questions or would like to bring Donald and GolfSimplified to your own home area or course.